« 10 Years of H.O.G. Old motorcycles represent millions of memories for about as many people. To the spirit of those who still find adventure behind the grips of an old motorcycle, I’m going to dedicate a post or two – as time permits – to early American cycling. Some will be about Harley’s as well as other great rides from a time long ago. They’re all old motorcycles now. There is a lot of history written about Honda. I owned several prior to the Harley switch. The quick read is that company founder Soichiro Honda developed a design for piston rings in 1938 and started to sell them to Toyota. During World War II, the manufacturing facilities were mostly destroyed, but Soichiro rebuilt the manufacturing plant and attached an engine to a bicycle which created a cheap and efficient transport. Honda’s first full-fledged motorcycle on the market was the 1949 Dream D-Type. They followed up with many other scooters throughout the 1950s. 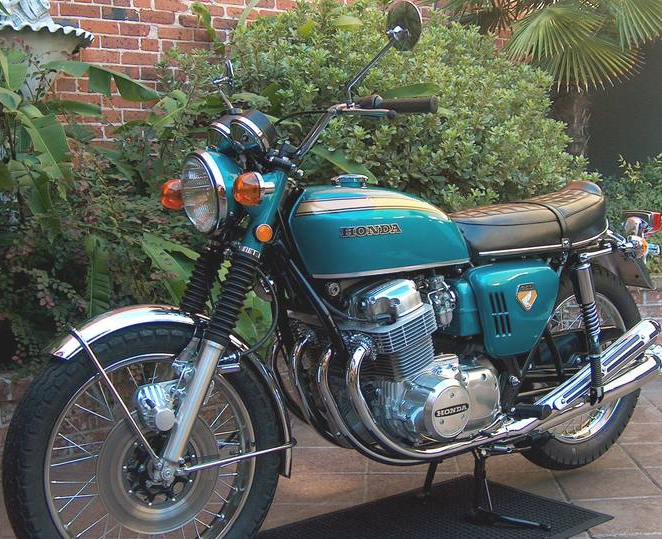 Honda introduced the CB750 motorcycle to the US in 1969. The bike was targeted directly at the US market after company officials fully understood the opportunity for a larger bike. It had 750-cc, 4-cylinder SOHC engine, electric start and disc brakes. The motorcycle set the bar very high for manufactures. Disc front brake and an inline four cylinder engine were previously unavailable on mainstream production bikes. And with a price under $1500 (US) it had significant advantages over British competition. The Honda four was so successful a number of smaller bikes followed. The CB350 launched in 1972 then the CB400, CB500 and finally the CB550 launched in 1974. All the models shared the same block with different bores. The SOHC design was made until 1982, and it introduced to the biker public to a 10,000 rpm redline and 100 mph hot rod. The “Supersport F” models even had 4-into-one exhaust pipes and the CB400F model had 6-speed transmissions. Yamaha had a couple of two-stroke motorcycles (RD350 and RD400) which directly competed and were faster and simpler. As you might recall the 70’s were full of metal flake colors and Honda was no exception with “Candy Jade Green” and “Flake Sunrise Orange”. I’ve read recently that a premium condition 1975 CB550K (four-into-four exhaust pipes) sold at Bonhams’s Legend of Motorcycle auction for over $7K. Wow! Whether you ride to rallies, spend hours tinkering, polishing adjusting or just sit in the garage admiring it, a lot of bikers think the Honda CB series were some of the best motorcycles ever made. Photo is courtesy of Henry Norris. Your facts on Honda models are off quite a bit. The CB350 was launched spring of 1968. Cycle magazine called it and the CL (scrambler) the best Honda ever. Does that mean it is the best motorcycle ever? Their words, not mine. (I rode those old 50’s, 60’s Harley’s BSA’s Triumph’s – truth hurts). The Scrambler (street bike, high pipes) won BAJA 1968 with Berquist aboard. Beat all cars and bikes, set new record. Honda’s first of many many Baja wins. Last I remember won by a 325cc twin. The CB550 four ended about 1978. The next redesgn loosely based on it was the 650. First DOHC was 1979 for the 750 Four. First six cylinder, 1979 CBX, world’s quickest when released, also DOHC. The Last CB350 was 1973 I believe. Replaced by the CB360 in 1974, then the 400 Hawk. First 4 valve head, 1972 XL250 enduro (owned 2). First 750 was the K0 made in 1969 and 1970. K1 had the 1 cable throttle, great improvement, 4 cables stretch (owned 1 each K0). Current rides — I own a 40 year old CL350 with 4,200 miles; A classic; a 650 dual sport (much modified). Next bike a wide glide, big twin number 3. I don’t count sportsters. None of them rev to 10,500 RPM like that 40 year old Honda of mine. The facts on the Honda 350 were correct the first time as talking about 4 cyclinder SOHC bikes not 350 twin. Most don’t even know that there was a CB350F F for Four cyclinder made 1972 to 1974. Very Rare machines. The old saying, Look before you leap !!! Honda twins are a whole different story. I just got a serious project bike, complete tear down, is there a particular place I should begin. The spokes are out, the engine is out, clean frame….. you get the point. Also, being north west could you recommend a place for parts or even a bike junk yard around Portland, Oregon. The wealth of knowledge on this forum is intense. I have fixed everything myself on my ’76 CB550 with the help of these folks. I like some of the new domestic rides, but I still think Honda’s are the way to go. They are what I drive. I borrowed a friends modified 750 F June 10th, 1976. At 70 mph the front axle froze on I-405 in Kirkland. I was killed instantly on impact. Fortunately, a nurse was following and performed life saving procedures. After a coma and paralysis and with the spinal fluid leak stopped, I limped back to life. I still love that 750 F but with my garage full of other bikes, I haven’t added one to my collection. well written article. I’ll make sure to bookmark it and return to read more of your useful information.